This is so wonderful and hopeful, Selena. I'm so happy for you! Selena, This should be shared with all of America. I truly appreciate your time and energy in being so specific and incredibly detailed, including offering explanations. Just brilliant. This is more than a blog, it is site for people to learn in a way that makes sense! Bravo!!!!! This offers such hope to a parent of a child with asthmultiple food allergies like mine. Can you tell me - did you do OIT in combination with the Chinese herbs? Or did you exclusively work with Dr. Li? I was wondering how your child is doing now. Also, I found out that Dr. Li does not accept insurance.If you have been following her for 18 mos, with the cost of the herbs/creams and follow up visits, I was wondering if she provides some sort of price negotiation. Thank you. I haven't had a chance to write my latest update, but our most recent labs are looking great. :) We did have a very strange asthma-related incident recently, which I also need to write up, but it was an anomaly, given how well my daughter has been doing, overall. Treatment with Dr. Li is typically for complex cases. Her main job is her lab research, but she works long, hard hours to see patients a few days out of the month. Her capacity to take on new patients is limited, so I would only advise pursuing her help if you have a complicated case (multiple food allergies, asthma, eczema, etc.) and the ability to tolerate writing a "blank check" to treatment. I don't mean to put it so plainly, but monthly costs can fluctuate and nobody can know, up front, how long treatment will take. Most of cost of treatment is for the protocol items, themselves, which are exceedingly costly to produce, at present, as they are not at a stage of mass-production. They also go through so many phases of quality and safety testing. This is a "cutting-edge" treatment and therefore has "early adopter" pricing. Treatment is also very involved and takes dedication and long-term perseverence, so that must be kept in mind as well. I don't mean to sound discouraging, but this is a resource-intensive treatment for those who really need intensive help. For my daughter's case, I feel it's absolutely worth the time, money, and effort, but everyone must make that decision based on their own particular situation. With eczema and asthma and overall health, we saw gains rather early on. I feel that her overall resilience and resistance to illness has greatly improved, as well. Her IgE levels have continued to drop and we are in the beginning stages of planning the slow introduction of some foods back into her diet. We have introduced "new" foods into her diet, along the way, and these were foods for which she had no reaction history and/or no positive test results. I'll report more of the details in my follow-up post. Hi, I am happy to hear that Dr. Li's protocol is working so well for your daughter. We have been seeing Dr. Li as well and treating my son for 2 years now (he is currently 4 years old) and are debating whether or not to continue. On the positive side his asthma (always mild) is now completely controlled with only occasional steroid use during illness, and illnesses have also become much less frequent/severe. Luckily he has never had eczema. Unfortunately his specific food allergy IgE levels have continued to rise significantly in spite of our strict adherence to protocol, though his total IgE has remained the same for the past 18 months. Curious if you have heard anything about some children taking much longer to respond to treatment? Also wondering if his young age is a factor - do you know any success stories from parents of very young children? Thanks so much and wishing you and your daughter all the best! If your child is young, you generally have time on your side, so I would personally lean towards hanging on a while longer, but that doesn't take into account the expense, labor, etc., and I believe it's a very personal, individual decision. I wish you the best! Wow! That's amazing that so much is helping her and you're able to start weening her off of things. I'm on antihistamines daily for years as well, and today I got some results back that came up moderately positive on almost everything your daughter has too (give/take a few) - I was looking for ways to interpret and read the results and stumbled upon your blog. Definitely interested now that it looks like I'll be doing some of the same. Thank you for sharing your story! Thank you for reading! I'm sorry you've received a lot of positive results on your testing, but hopefully your allergist will carefully go over the results with you, as IgE can be so hard to interpret. I have written quite a bit about it, but there are still no definitive answers. I wish you luck on your search for answers and hope you are able to make some progress, soon! 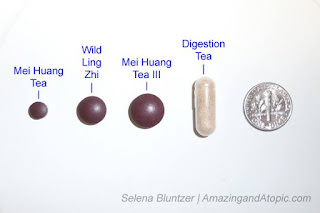 I highly encourage you to join the "Chinese Herbs for Allergies" group on FB. You can search old threads on this topic. IgE is, unfortunately, a highly imperfect biomarker and has been known to rise before falling, or any other number of scenarios, without always indicating progreys in a direct fashion. (((HUGS))) I know it's hard, because it's hard work and we want easy to read "reports" that aren't available. Try not to be too disheartened. Always discuss your concerns with Dr. Li, as she can provide individualized guidance.